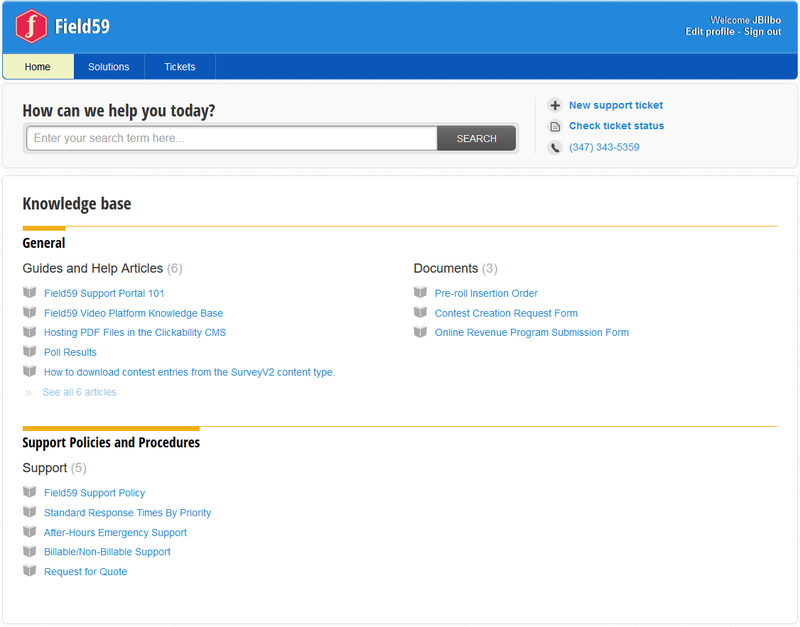 Field59 has migrated to a new support/help desk portal. The purpose of this transition is to better serve you, our customers, by providing improved access to support. The new support portal is located at https://field59.freshdesk.com. Direct links to the portal are also located on http://www.field59.com/support/ and http://www.broadcast-interactive.com/Products/About/BimSupport. 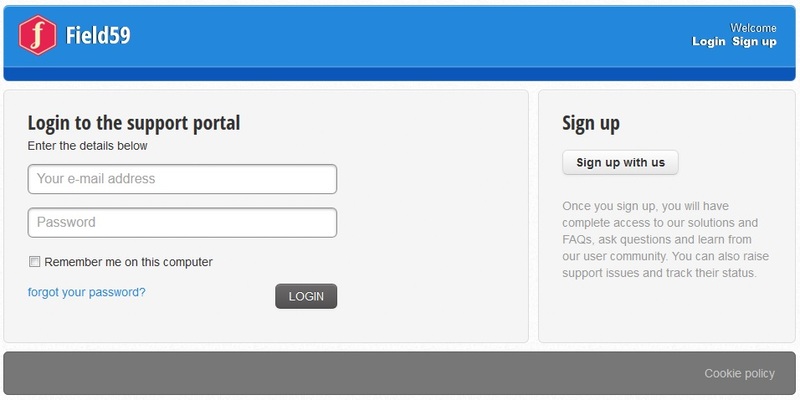 The new portal allows anyone to register for an account and submit support tickets. Visit https://field59.freshdesk.com and click the sign up link. Simply enter your full name, email address, and reCaptcha, then click Register. You will receive a confirmation email which will complete the registration process, including setting your password. Return to https://field59.freshdesk.com and enter your email and password. After you’ve logged in, you’ll see a screen with 3 tabs across the top, a search field and knowledge base, and links for submitting tickets and checking the status of existing tickets. To submit a support ticket, click the “New Support Ticket” link located near the top-right corner of the home screen. 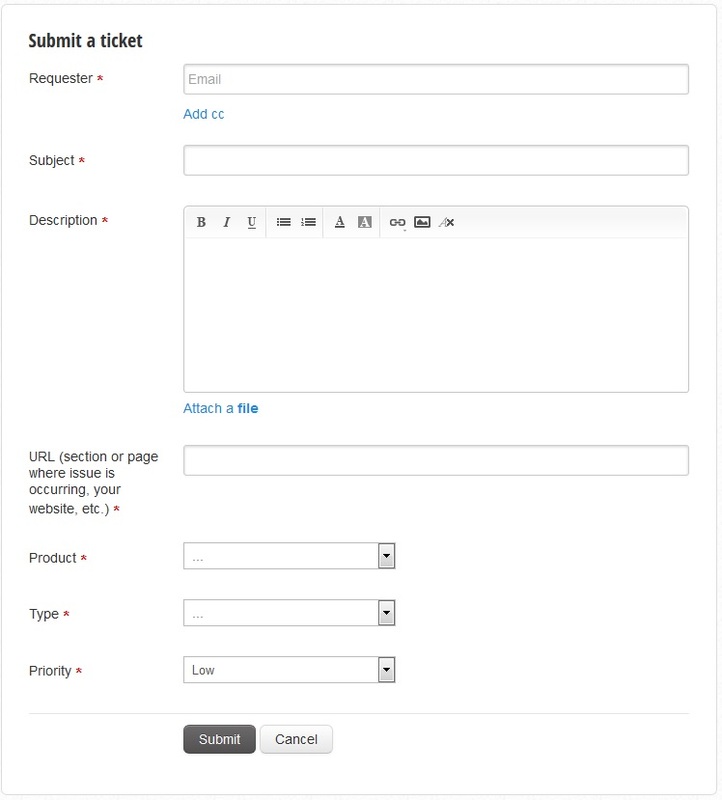 Requester: This field will default to the email address associated with your support portal account. Optionally, you can CC other email addresses. For example, you could use this field to notify co-workers or managers that your ticket has been submitted. Subject: A brief statement that describes the purpose of the ticket. Description: A detailed account of the work you need Field59 to complete or problem that you are experiencing. Attach a file: You may attach any files such as screenshots, images, or documents associated with your case. URL: A URL associated with the web page or website where work should be completed or where an issue is occurring. This field is very important and allows us to serve you, and correct issues more quickly. Providing an accurate URL allows us to get directly to the webpage where an issue might be occurring, or where work is needed. Product: Select the option that best fits your case. This helps us route tickets to the appropriate support staff. Question: You have a question or inquiry that needs answering, or would like a quote on a new development project. Problem: You have a problem, or would like to report an incident that is occurring or has occurred. Task: You need us to do something for you; setup a new CMS login, create a section, traffic a new pre-roll campaign, etc. Priority: Select an option that best fits your situation. Please reserve use of the Urgent (Emergency) priority for issues such as site and CMS outages. Please refer to the Field59 Support Policy for guidelines on what constitutes an Emergency. Once your ticket has been submitted, you will receive a confirmation email indicating that the case has been successfully submitted and received by our support team. Once your ticket or tickets have been submitted, you can manage your tickets by selecting the “Ticket” nav on the portal home screen, or by clicking the “Check ticket status” location near the top-right corner of the home screen. 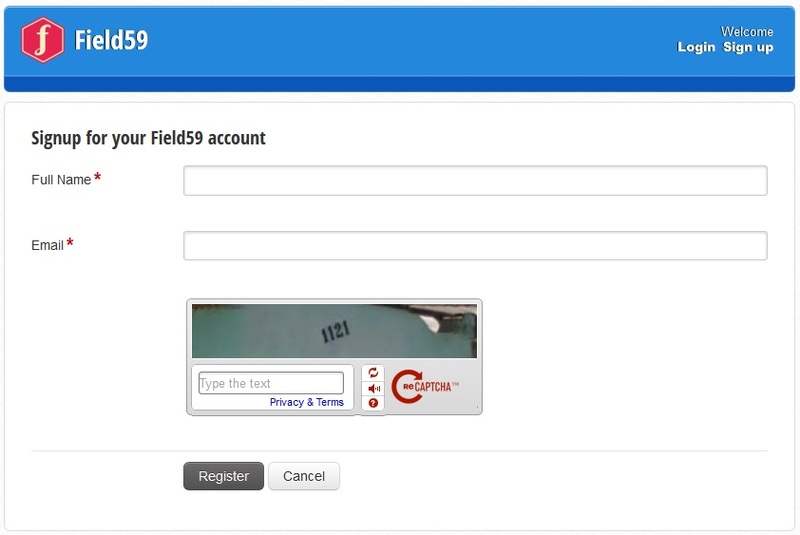 The Field59 Support portal also offers the convenience of replying to cases via email, so logging into the portal is not required for managing your cases. However, you can always visit the tickets page to view all of your tickets; even closed tickets. Closed tickets can also be reopened by adding a new reply.